Split Rail Fence - Contact Our Fort Collins Fence Contractors | Advanced Landscaping & Sprinklers, Inc. Fences are an important element of any home or business. Fences provide your property with protection, privacy, and a beautiful framing effect. Split rail fences have become popular options for residents and businesses looking to demarcate their property from the surrounding areas without compromising aesthetic appeal. In fact, choosing to install a split rail fence is a great way to increase your home or business’ value! As a Top Rated Local® landscaping company accredited by the Better Business Bureau, you can trust that our fence installation services are the best you’ll find in Fort Collins and the surrounding areas. Contact our fence contractors for a free estimate, and get started on a split rail fence installation today! Also known as “log fences,” split rail fences are a beautiful and elegant fencing option that have been popular in the United States since colonial times. 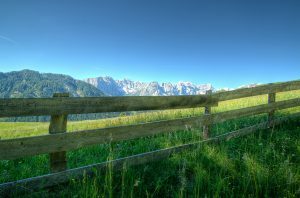 Split rail fences require more materials than other fencing options, and so they are typically found on rural and agricultural properties. While split rail fences were originally used to contain livestock and to make the boundaries between farm properties clear, urban and suburban homeowners alike are choosing to install split rail fences on their properties. Split rail fences are typically built using cedar wood, though other options can be used as well. Unlike standing fences, which require regular upkeep and painting, split rail fences typically require very little maintenance. Adding a fence to your residential property is a nearly-guaranteed way to raise your property’s value, and your home’s curb appeal will skyrocket when you adorn it with a beautiful split rail fence. If you’re looking for a way to mark the boundaries of your business while adding aesthetic value to the land around it, a split rail fence is the perfect option for your commercial property. For business owners who don’t want to burden themselves with expensive maintenance and upkeep, split rail fences are the ideal option. Split rail fences provided livestock containment for Colonial Americans in times of plenty, and they provided firewood and shelter in times of scarcity. Show your customers that you’re passionate about the American tradition by choosing to install a split rail fence! We offer free estimates, so don’t hesitate to contact our Top Rated Local® Fort Collins fence contractors! Advanced Landscaping & Sprinklers, Inc. accepts both credit cards and checks. Additionally, we require no payment for small projects until the job is completed.